Embrace Emotional Eating: Reading the Clues to Your Feelings and Needs - Am I Hungry?Am I Hungry? Do you eat for emotional reasons? Of course you do! Everybody does. Soon after birth we develop powerful emotional connections to feeding, eating, and food. We eat to socialize, nurture, express love, have fun, soothe a hurt, and reward ourselves for a job well done. In our food abundant environment, eating is a readily accessible way to add pleasure to our lives. If you feel your emotional connection to food is causing problems for you, these suggestions may help you bring emotional eating back into balance. Avoid labeling yourself (or your client) “an emotional eater.” Labels become self-fulfilling prophecies. Instead, identify the behavior since unlike personality characteristics, behaviors can be explored and changed. Examples: emotional eating, eating when I feel stressed, using food for comfort, eating as a form of entertainment, etc. Get back to the basics. To identify emotional triggers, ask “Am I hungry?” whenever you feel like eating. If there are no physical signs of hunger, it’s likely that the urge to eat was triggered by environmental or emotional cues. Leave judgment at the door. Guilt and shame feed the eat-repent-repeat cycle and close the door on learning. Have compassion for yourself. When you eat for emotional reasons, you are simply trying to take care of yourself. What could you do that might work better? Respond instead of react. Realize that a “trigger” is just that – a coping mechanism that you can choose to pull or not. Choose how you’ll respond to your triggers instead of reacting automatically. Read the need. Your desire to eat when you aren’t hungry is a doorway into your underlying feelings and needs. Cravings can be clues. The food you crave may give you insight into the underlying emotion or need, i.e. comfort food. 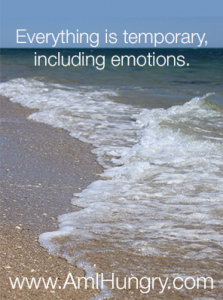 Avoid labeling emotions as good or bad, or positive or negative. All emotions are information that you can use to better understand your interpretation of an experience and help you recognize your true needs. This too shall pass. Ride your emotional waves as if you were floating on a raft. All emotions come and go. It is futile to resist the ones that feel unpleasant; resistance only adds to your discomfort. Likewise, it is pointless to cling to the emotions that feel pleasant; just enjoy them while they last. Create a self-care buffer zone. Caring for your body, mind, heart, and spirit builds resilience to the stresses of life. When you practice regular self-care, you will be less likely to turn to food to manage your emotions. Ask for help when needed. Reach out to a counselor, coach, pastor, or an Am I Hungry? Facilitator to help you understand and cope with emotional eating. Over the years, I’ve learned to heal the emotional connections to food that weren’t serving my highest good. I’ve also learned to embrace my healthy emotional relationship with food. When I’m craving chocolate even though I’m not hungry (and sometimes when I am! ), I’m probably bored of working at my desk or I’m feeling overwhelmed and in need of a break. I also love the emotional connection of cooking with my chef-husband, dining with my friends and family, and savoring a fabulous piece of chocolate-simply for pleasure!